“Regional Glimpses”, a new exhibition featuring the works of Louise Derry and Andrew Linklater, is currently showing at MISSION BEACH ARTS CENTRE. The combined talents of these Cairns based artists results in a vibrant show of colour, energy and an obvious passion for the subjects they portray. 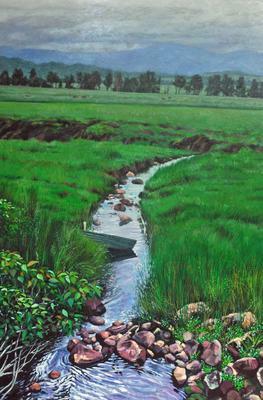 Louise‘s pastel paintings capture the essence of the land and views around us with tremendous clarity. She is clearly inspired by the vast open spaces of the region and particularly the turbulent drama of our tropical climate. 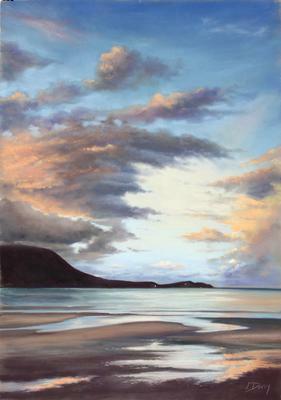 Her fascination for skies combined with her distinctive moody, atmospheric style, results in evocative works that are strong and vibrant yet sublime and sensitive, and altogether very engaging. Andrew’s life-long interest in art was only realized for the first time after retiring, and many years of saying “One day I’d like to try my hand at painting”. The catalyst was attending ART Escape in Cairns four years ago, being introduced to acrylics, and loving it. He progressed to oil paints and recently has been exploring the use of coloured pencil. He excels in distilling the image down to the essential elements to convey a pleasing visual story enhanced with his characteristic detailed texture and colours. Never before has there been such a young hearted, enthusiastic, desperate-to-improve apprentice painter, with white hair and a senior’s card! Regional Glimpses is on show until Sunday August 12, and open every day until 4pm. I wish I could paint like that/this. Looking at your work is like a travel brochure, or a mini vacation.